High school juniors from low-income communities in Birmingham, Alabama have the opportunity to travel abroad to Beijing, China to study in a four-week cultural and language immersion program with peers from across the United States. 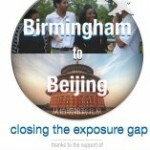 Our Birmingham students are applying for study abroad through the Americans Promoting Study Abroad (APSA) Initiative. This national non-profit organization partners with urban school districts across the United States to make study abroad opportunities possible for low-income students. All candidates are accepted to the program through a competitive application process, including essays and in-person interviews before a review committee. This initiative will change these students lives forever, setting them on a pathway towards international cultural and language competency. The experience will enable them with differentiating skills that will allow them to compete globally throughout their academic and professional lives. Our language course is structured similar to a Chinese 101 course that might be held in university settings: The course is led by a university instructor from a local college, uses college textbooks and workbooks, and meets for 90 minutes on a Tuesday/Thursday afternoon schedule. Students completed a competitive application process for the program and all participants voluntarily dedicate their time after school to learn this critical language. 100 percent of students will earn “Level 1” status on the HSK Basic Chinese Language Proficiency Test in 2012, meaning that they will have mastered over 150 Mandarin sight words/characters. 100 percent of students will apply for international language study abroad in China in summer 2013. 100 percent of students accepted for study abroad will qualify for language-learning fellowships and scholarships to facilitate their international experience in summer 2013.